The driver Mario Dominguez was born in December 1, 1975 in Mexico City. He began his career in 1987. Won the title three times in carting champion, he will represent his country in three different countries - Spain - in 1989, Italy - in 1990, and France - in 1991. Talented racing driver Mario Dominguez was able to keep winning in 2002 at Honda Indy 300, and in 2003 won the Grand Prix in Miami. 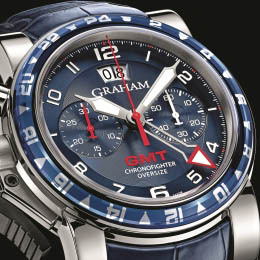 Dominguez is the ambassador of Graham since 2011. The model Silverstone Stowe Racing Mexico, designed for the rider, is released in a limited edition - 100 items. Diameter of the steel case with black PVD coating is 48 mm. The black dial, made of carbon fiber, equipped with white Arabic numerals, three hands, from which the hour and minute ones are made in white, and the second’s one - in red. On the black dial looks original minute’s pointer with red rim and red lettering “Mexico” at the 6 o’clock position. The outer ring of the dial is painted in green. Black carbon fiber dial is protected by a sapphire crystal. The model comes on a rubber strap in black with a red stripe and a black ceramic buckle. The watch water resistant is 100 meters. The Silverstone Stowe Racing Mexico watch is collected on the basis of an automatic mechanism G1734 at 27 jewels, with a frequency of 28,800 vibrations per hour and a 48-hour power reserve.